This past winter I had the pleasure of constructing a unique, one-of-a-kind kachelofen here in my home state of Ohio. 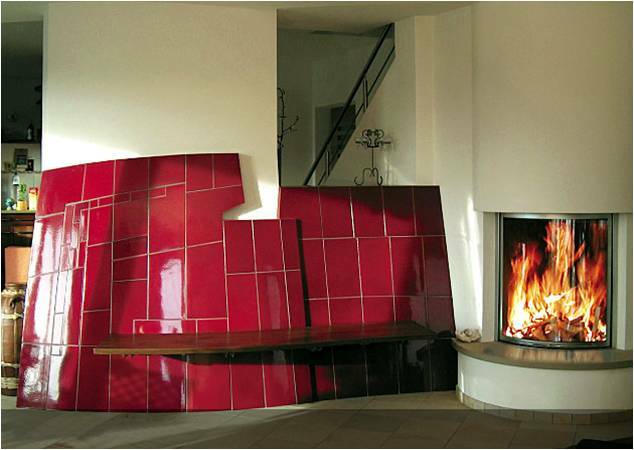 The beauty of constructing a masonry heater from kacheln (structural heater tiles) is that, along with unlimited design possibilities, there are virtually unlimited color possibilities as well. While I love soapstone and its unique and superlative masonry heater qualities, all structural soapstone of which I am aware is a gray color. I really like it and so do a lot of other people. And gray is neutral enough that it is compatible with many, many decorating schemes and colors. Most people who see, in person, a soapstone masonry heater, recognize that soapstone is usually not just gray. Like marble, it has veins of beige, white, or lighter or darker gray. Often it will also have specks of iron in it that, when honed and aged, look gold. Nevertheless, it is predominantly gray. Kacheln are a complete other story. Just like the plates and coffee cups in your kitchen cupboards, kacheln can be really any color imaginable. This means, when someone has distinct tastes and a definite decorating theme planned for their home, they can complement that theme to whatever extent they like with tiles. In my view, the kachelofen is THE THING for those who truly want an indivudualized piece of art for their masonry heater. And this past winter, I built such a piece of art for a couple in Ohio. The kacheln for this kachelofen were made, by hand, by Jessica Steinhauser, of Stonehouse Pottery in Guelph, Ontario, Canada. Jessica does wonderful kachelofen of her own, as you will see if you visit her website. It is fantastic to work with her. Though color is a very individual thing, when my clients are put on the spot to name the colors with which they will live for the rest of their lives, they are often at a loss. Jessica helped a lot by sending actual samples of ceramic with a wide range of colors. After much uncertainty, my clients chose two basic colors and the matter was settled - or so we thought. When Ms. Steinhauser began glazing and firing glazed kacheln, she was panicked to find that there was tremendous color variation among the kacheln arising from the kiln. She had not used this particular type of glaze for kacheln before and she was worried that, rather than finishing the job, she was ruining it! She sent photos that I forwarded to my client. 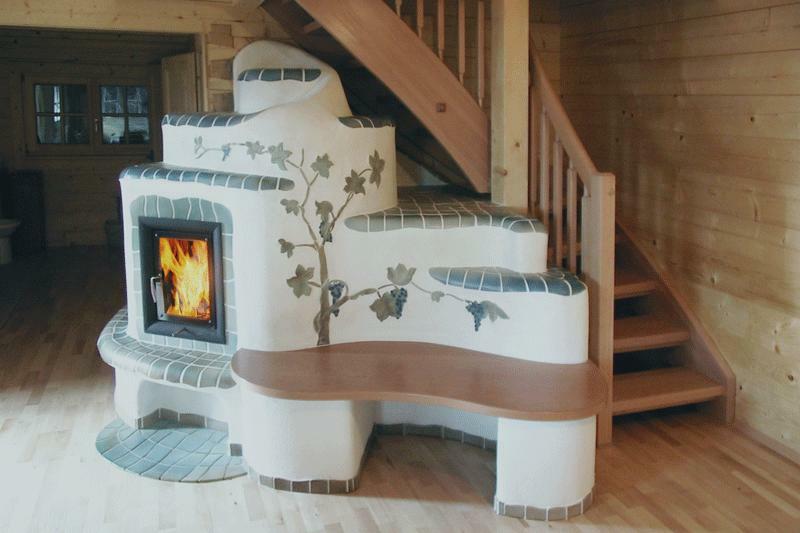 A true American kachelofen combining plastered benches topped with black granite, a firebox turned 15 degrees from the otherwise rectilinear aspects, and beautiful golden kacheln. It's a mufti-faceted masonry heater. Granite shelves complement the black granite benches.